Friends, I know how crazy fall can be, but I’ve got your back! 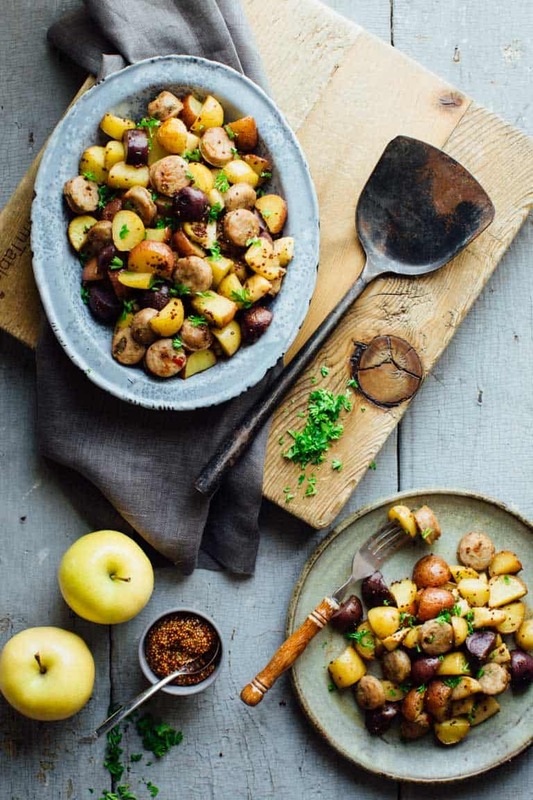 Check out these Roasted Potatoes with Apples, Sausage and Maple Mustard Glaze. With just 20 minutes of prep and only one pan you’ll be able to put a delicious kid friendly dinner on the table without breaking a sweat. And it’s dairy free and wheat free! I originally shared this recipe on May 6, 2012. I have updated the images and some of the text today. Hello fall! And just like that summer is over and we’re all doing our annual run-around-like- chickens dance. This is the time when we’re all still trying to let go of those long lazy days and get back into a routine. The kids have new schedules and activities and your head is spinning like… wait… who, what, where?! And then dinnertime rolls around and you’re like… oh right, I have to feed these people food! Well, I do have to give myself a pat on the back for this recipe. It is quick, simple, easy to clean up and seriously yummy! It is inspired by the red and gold thin-skinned potatoes and storing apples we’ve been getting from our CSA share. To that I add chicken sausage and a speedy maple mustard glaze. It is sweet and savory, and most importantly doesn’t require much attention from me. Major bonus! Don’t miss these other awesome one pan meals from my blogging friends and me that will save you from the dreaded… Oh no, what the heck am I going to make for dinner?! 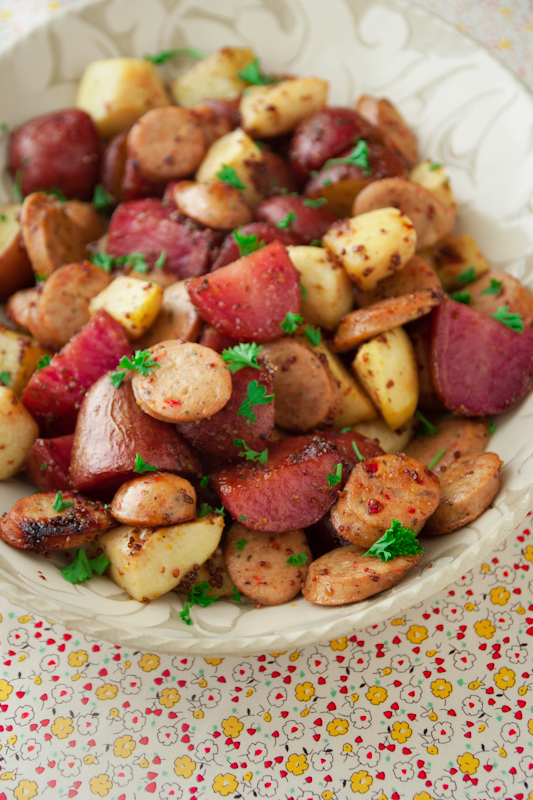 Check out this Roasted Potatoes with Apples, Sausage and Maple Mustard Glaze. With just 25 minutes of prep and only one pan you’ll be able to put a delicious kid friendly dinner on the table without breaking a sweat. And it’s dairy free and wheat free! 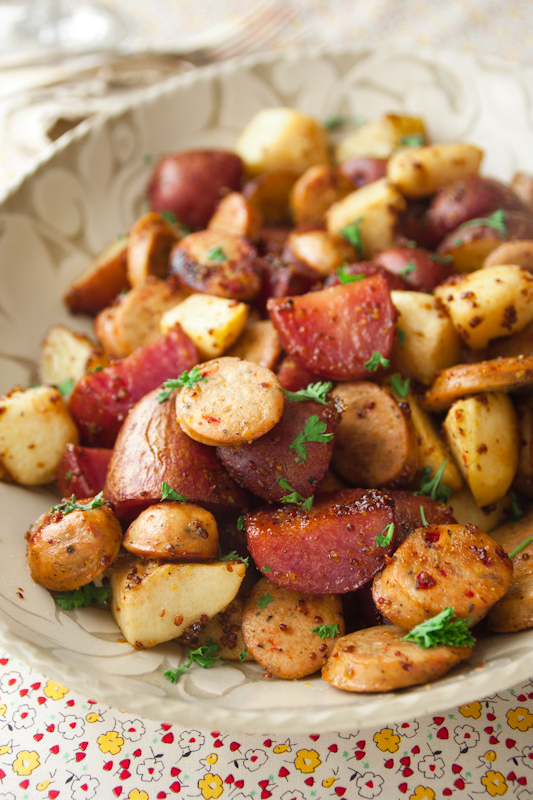 Toss potatoes, oil, salt and pepper in a large bowl until coated. Spread out in a large heavy roasting pan. Roast 10 minutes. 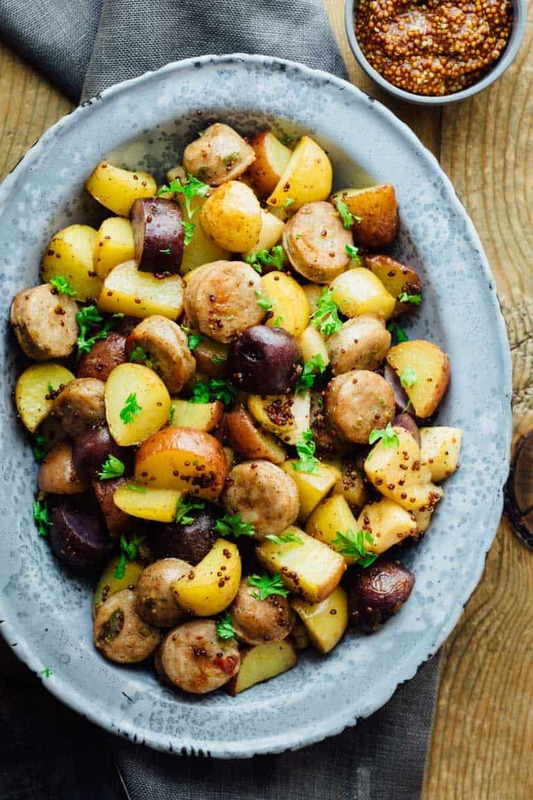 While potatoes roast, stir sausage, apples mustard, maple syrup and vinegar together in the bowl. Reduce oven temperature to 375°F. Remove roasting pan from the oven. Scrape potatoes up from the pan with a spatula. Add sausage, apples and the mustard mixture to the potatoes and toss to combine. Return to the oven and bake, stirring once or twice until the potatoes and apples are tender and the glaze is caramelized, 45 to 50 minutes. This recipe saved my dinner menu when I was struggling. I used it as a side with Pecan encrusted Salmon and roasted Brussel sprouts. To the leftovers I’ll add sausage for a main course another night. Thank you Katie! Mustard, thank you! I threw together some red potatoes from the garden with a few of the excess apples from the co-op basket, onions, carrots, garlic added some thyme, rosemary and a drizzle of maple syrup, then started questioning my sanity. I was thinking apple cider vinegar, but will add some course mustard too. Yum! [quote name=Nika]Mustard, thank you! I threw together some red potatoes from the garden with a few of the excess apples from the co-op basket, onions, carrots, garlic added some thyme, rosemary and a drizzle of maple syrup, then started questioning my sanity. I was thinking apple cider vinegar, but will add some course mustard too. Yum![/quote]Awesome! Great minds think alike! This recipe looks great! Do you think I could make it in the crockpot? This was excellent! 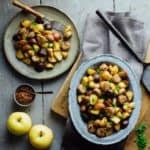 I have made different versions of apples, potatoes and sausage before but none of those recipes had the wonderful sauce that your recipe has. We used granny smith apples to add some tartness but otherwise made just as written. This is a keeper. Thanks for sharing. I didn’t have any real maple syrup so I substituted honey and it was delicious. Thanks! Glad you liked it Lisa! Have a great day! am looking at this for a breakfast recipe. Would you say it would go good as a brunch dish? It looks amazing!! I would love this as a brunch dish. Try it with breakfast sausage! This is the perfect recipe to start fall off with. I will be trying this out. Thanks for sharing! Thanks so much Karl and I hope you enjoy it! I’m a big fan of one-pan meals, and this one sounds delicious. As a newcomer to your blog I’m glad you reposted this one. That’s so great to hear. I hate to think it was hiding in the archives unnoticed by new comers, as it is one of my faves! So glad you are confirming that my instinct was right there. And welcome to the community. Have a great evening. Excellent!! I used venison sausage and Honeycrisp apples and added onion. Will definitely make again!